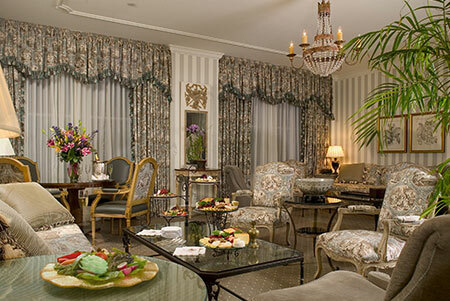 With 55 New Orleans luxury suites, Hotel Monteleone can accommodate practically every traveler’s need. 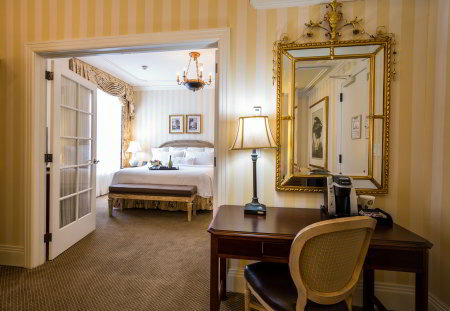 Enjoy your French Quarter visit in one of our luxury New Orleans suites.  Stay in one of our Signature Suites, Executive Suites, Vieux Carre Suites, Riverview Suites, or Royal Salons. Ranging from 207 square feet to over 551 square feet, these luxury New Orleans hotel rooms offer panoramic views of New Orleans. 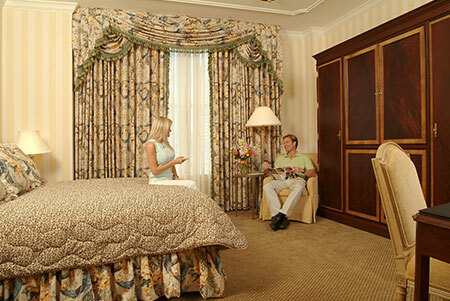 Enjoy the overstuffed beds, garden tubs, and upscale amenities our New Orleans luxury suites offer. All guest suites feature portable telephones, high-speed Internet access, and other upscale hotel amenities. Salon dimensions are 16′ x 16’3″ – 330 sq. ft. The Royal Salons feature oversized king-bedded rooms, and afford an exciting view of the Mississippi River or the city. The marble and granite bathrooms include a garden tub and separate glass shower. These New Orleans luxury salons feature a portable telephone, high-speed Internet access, and other upscale hotel amenities. Parlor dimensions are 13’5″ x 15′ – 207 sq. ft. Entire suite is 540 sq. ft.
Executive Suites at Hotel Monteleone offer a king-bedded room with a parlor separated from the bedroom by French doors. The Executive Suite parlor includes a sofa bed for an extra guest. The bathroom in this New Orleans luxury suite is marble and granite. The suite features a portable telephone, high-speed Internet access, and other upscale hotel amenities. Parlor dimensions are 13′ x 15′ – 211 sq. ft. Entire suite is 500 sq. 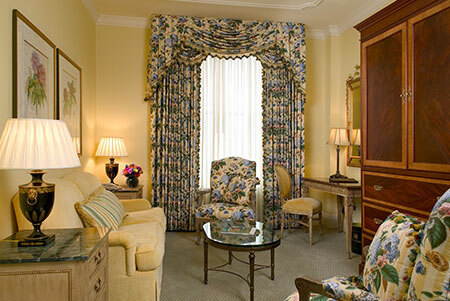 ft.
All Vieux Carre suites offer a king-bedded room and a separate parlor with a sofa, small desk and half bath. The marble and granite bathrooms include a garden tub and separate glass shower. The Vieux Carre suite features a portable telephone, high-speed Internet access, and other luxury hotel amenities. Parlor dimensions are 16′ x 16’3″ – 330 sq. ft. Entire suite is 601 sq ft.
Riverview suites offer a king-bedded room and a separate parlor with a sofa, small desk and half bath. The marble and granite bathrooms include a garden tub and separate glass shower. The Riverview suite features a portable telephone, high-speed Internet access, and other upscale hotel amenities. Parlor dimensions are 22′ 4″ x 22′ 7″ – 767 sq ft. Entire suite is 1,045 sq ft.
Frank Monteleone assumed his father’s legacy in 1913. Fifteen years later, he added the 200-room section where this suite is located, at the same time successfully steering the hotel through the Great Depression. His namesake suite, our largest, is dedicated to his memory. 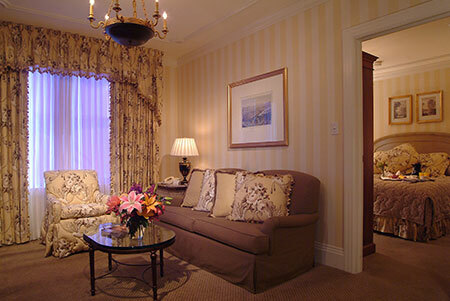 The FJ Monteleone Suite offers a luxurious king bedroom and granite bath with Jacuzzi tub and glass shower. This New Orleans luxury suite has a vast parlor with panoramic views of the Mississippi River. The suite also has a sofa bed, plasma television, wet bar, and many other amenities. Additionally, the FJ Monteleone Suite includes an adjacent office setup with fax machine. The marble and granite bathroom feature a garden tub and separate glass shower. This suite features a portable telephone, high-speed Internet access, and other luxury hotel amenities.